Harden Baine Pennington was born on April fool’s Day, 1884, the sixth child of Henry Allen Pennington (1853-1925) and Mary Lena (Beeson) Pennington (1851-1937). He was a farmer and rancher, as well as a carpenter, spending most of his life on the Pennington land located west of Grapeland. When Harden was 24 years old he took as his bride, Miss Flora Alice Lively (born July 15, 1889), daughter of Mr. and Mrs. Milo “Cool” Lively. They were married in December of 1908 and lived the rest of their lives on Pennington land, their last home being the brick home located seven miles west of Grapeland, now occupied by their youngest son, Delbert, and his wife. The young couple wasted no time starting a family. Their first son, Charles Elwood, was born the following December. They had four more children, Henry Milo, Odessa Loye, Barney Opal, and Delbert Harden. Harden passed away on March 23, 1966. Flora passed away They are both buried in the Pennington Family Cemetery. 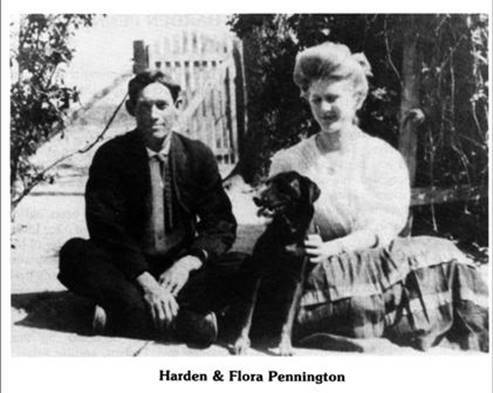 The oldest child of Harden and Flora Pennington was born December 8, 1909. He graduated from Grapeland High School and attended Sam Houston State Teachers College in Huntsville for two years (1927-1929) but had to drop out of school when the depression hit so he could go to work. While in college he majored in business administration and played violin in the college orchestra. After leaving college he taught school one term in a two-teacher school at Oak Grove, near Grapeland. The next year he left home and went to work for Curtis Publishing Co. with a crew of young fellow’s selling magazine subscriptions in Oklahoma and later, in Kentucky. “Jobs were hard to find and you were lucky to be peddling magazines,” he says. He was only 21 at the time and was pleased to get a chance to see a lot of the country. After the magazine peddling venture ended, he migrated to Sweetwater,Texas, where he went to work for a furniture store owner as bookkeeper and what he refers to as “a general flunky”. Elwood says he likes to tell his friends that after working for him for about three or four years the owner went broke and claimed bankruptcy – his employee squandering enough money to get into business for himself. That was not exactly the case. They did put in a furniture store in Odessa, Texas, in 1937, on a partnership basis. The business grew and prospered until World War II came along. Elwood then sold the partner his share of the store and joined the Air Force for a three year tour of duty. Later, after his time in the service, he bought a furniture store in Lamesa, Texas, and was in the business there a number of years, also owning a branch furniture store in Colorado City, Texas. Elwood’s wife is the former Lee Hill. They met on a blind date while they were both working in Odessa. They were married in 1941 and have no children. In 1962, he and his wife sold the two stores and retired. They now reside in San Angelo, Texas. The second child was born February 27, 1911. Milo chose for his bride, Eleanor Fox (born February 10, 1917), of the Reynard community. They were married December 27, 1947. Milo and Eleanor have one adopted son, John William, born February 24, 1943. He married Wanda Hall of Elkhart on April 4, 1964. They have five children: 1. Angela Regae, born October 19, 1966 2. Laura Colleen, born December 6, 1967. She married Matthew Tokarczyk on August 29, 1986. 3. Vanessa Johnelle, born December 6, 1969. 4. Robert Harden Leon, born August 20, 1971. 5. Christine Marie, born February 9, 1985. Milo was a farmer and rancher for many years and Eleanor was a schoolteacher. They are retired and currently reside in Elkhart. The fourth child was also a daughter, born November 15, 1914. She married Bert Brimberry on December 11, 1935 and they had two children. Their daughter, Pat, was born February 13, 1937. She married Vernon McCluney on January 20, 1956. They have three children: Paul Wayne (January 13, 1960), Pamela Kay (September 10, 1965) and Perry Alan (March 13, 1970). Their son, Baine, was born July 27, 1942. He and his wife. Cheryl, have two children: Darren Wayne (June 5, 1973) and Sean Harden (December 5, 1974). Opal currently resides in Houston. Almost thirteen years passed and then another son was born. Delbert Harden was born March 26, 1927. He is a 1944 graduate of Grapeland High School. Following graduation he joined the navy during World War II. On September 23, 1950, he married Lenora Bell McLemee (born December 2, 1933), the daughter of Gordon and Iva McLemee. 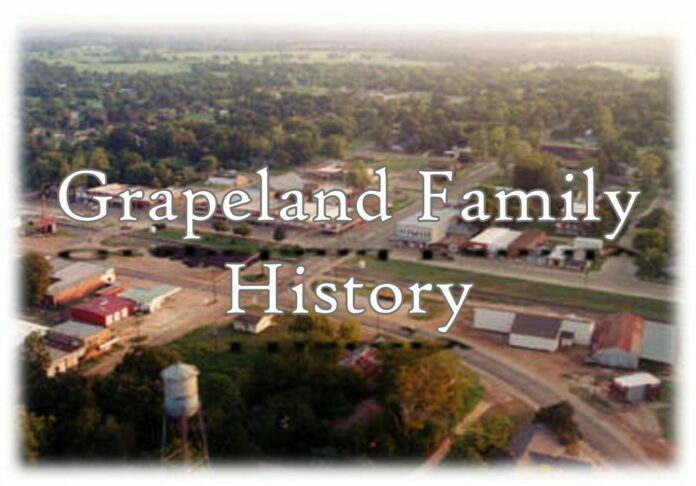 The newlyweds first lived on the family place west of Grapeland, moving to Houston and later to Pasadena where their first daughter was born. Donna Diane was born December 28, 1955. She graduated with many honors from Grapeland High School in 1974 and attended Stephen F. Austin State University. She married James Christopher (Chris) Larkin (born August 7. 1956) on August 30, 1975. They have two children: Michael Christopher, born April 19, 1978, and Andrew Pennington, born November 24, 1981. Chris received many honors and scholarships from the University of Texas at Tyler where he earned a B.B.A. in accounting the summer of 1986. Donna is currently attending college, working her way towards a degree in education. They reside in Grapeland. Delbert and Lenora had just returned to Grapeland when their second daughter, Debora Denise, was born on March 15, 1963. She was also an honors graduate of Grapeland High School. She finished high school in 1981 and attended Stephen F. Austin State University, Tyler Junior College, and the University of Texas at Tyler where she earned a Bachelor of Science degree in journalism in May, 1986. While at U.T. Tyler and T.J.C., she received several journalism awards and served as assistant editor of the “T.J.C. News”. She currently resides in Grapeland and works for “The Grapeland Messenger”. ].